A chemist in the College of Arts and Sciences has received a major research fellowship from the Alexander von Humboldt Foundation, known for promoting academic collaboration among scientists and scholars from Germany and around the world. Ivan V. Korendovych, assistant professor of chemistry, has been awarded a Humboldt Research Fellowship to study protein engineering. Specifically, he will examine the manner by which proteins catalyze chemical transformations—a process that has applications for science, medicine and industry. Korendovych will spend several months working alongside Uwe T. Bornscheuer, professor of biotechnology and enzyme catalysis at the University of Greifswald, and Manfred T. Reetz, the Hans-Meerwein Research Professor Emeritus at the University of Marburg. Both universities are in Germany. The result? New ways of looking at how proteins function. Karin Ruhlandt, Distinguished Professor and chair of chemistry, is proud of Korendovych, whom she helped recruit to Syracuse University more than three years ago. 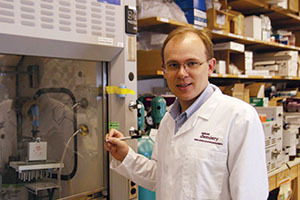 Prior to Syracuse University, Korendovych served as a postdoctoral fellow at the Perelman School of Medicine at the University of Pennsylvania. He earned a Ph.D. in chemistry from Tufts University.